GrizWalk is a free service offered to students and employees to ensure that no member of our campus community has to walk alone after dark. 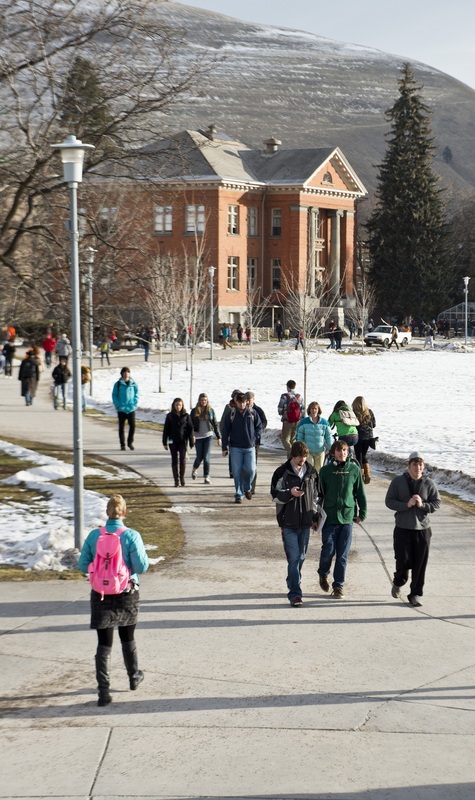 GrizWalk is staffed by both students and campus police. Members travel in pairs and wear distinctive clothing, and carry radios and flashlights. This nighttime service is available seven days a week while school is in session. Just call 243-2777, and a GrizWalk member will be dispatched immediately to meet you at your location and walk you to your destination. Whether or not you think of yourself as a pedestrian, it's important to remember that every trip always begins and ends on foot. Follow these guidelines to keep you safe and alert. When out at night or in the early morning, wear bright or reflective clothing, or use a light. Think of the sidewalk like a road – stay to the right and pass on the left. When in groups, make sure you are still only taking up half of the sidewalk (or less). Check behind you before cutting across the sidewalk. You have the right of way – stay on your path and allow bikes to maneuver around you. Stay off your electronic devices and stay alert! Distracted walking causes collisions. Cross only at intersections when possible. Always wait for the “walk” sign before proceeding. When crossing mid-block, yield to motor vehicles. Clearly indicate your intention to cross the street. Walk defensively – never assume a driver sees you. Make eye contact with motorists and bus drivers before crossing. Always choose the safest route available – even if it’s not the fastest route. Watch for cars making turns, pulling out of driveways, or backing up in parking lots. Walk on the sidewalk. If one is not available, walk facing traffic as far to the left as possible.